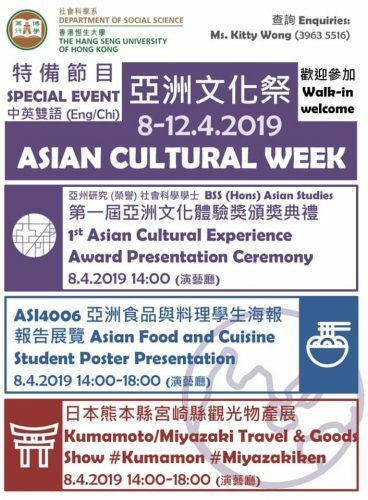 Department of Social ScienceEvents NewsAsian Cultural Week 2019! 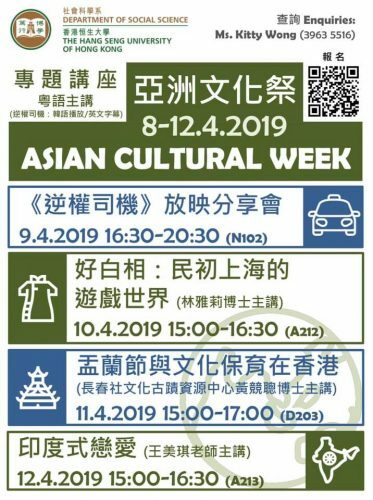 Please come and join the HKUHK Asian Cultural Week 2019 on 8-12 April 2019. Excellent and interesting events included: Asian Cultural Experience Award Presentation Ceremony, Hong Kong and Korea Film shows, Talks on Indian Love affairs, Yoga Class, Tea Sharing Party, Japanese Comics Workshops, Exhibitions from Kumamoto and Miyazaki Travel and Goods, Karaoke Singing Contest, Meeting the Mascots from Japan (Kumamon and Miyazaki-ken), Asian Food and Cuisine Poster Presentation, and local culture experience activities, etc…. 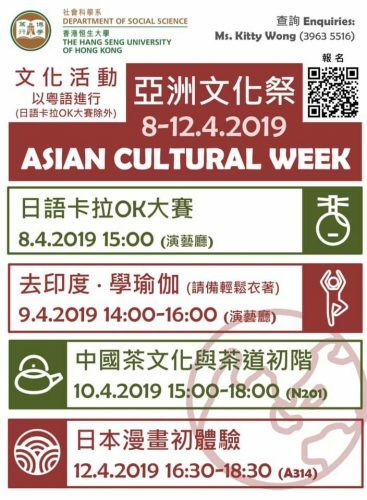 Please come and join all the activities!